Local Library Employs the Services of "Ghost Hunters"
The Secrets of Surveys: When Can You Trust Them? Fran Featherston (at left in photo) is retired from the U.S. federal government where she worked 27 years as a researcher at the National Science Foundation (10 years) and the Governmental Accountability Office (17 years). Her areas of expertise are survey research, research design, and designing methods that are user friendly. Results of May's NCAS member vote on candidates for the board of directors have been tabulated. Re-elected and incumbent members are: Nelson Davis Jr, Chip Denman, Grace Denman, Bing Garthright, Brian Gregory, Curtis Haymore, Beth Kingsley, J. D. Mack, Melissa Pollak, Walter F. Rowe, Scott Snell, Jamy Ian Swiss, and Marv Zelkowitz. At the April 4 board meeting, the board was reduced to thirteen voting members, commencing after the 2015 election results became official. The board was unanimously unconcerned about triskaidekaphobia. At its May 26 meeting, the NCAS board of directors selected its officers, who are: J. D. Mack, president; Walter F. Rowe, vice president; Marv Zelkowitz, secretary; and Beth Kingsley, treasurer. 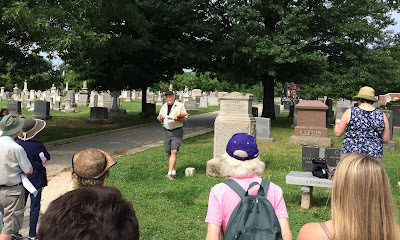 The third annual NCAS SkepTour was held on the morning of Saturday, June 13, 2015 at Congressional Cemetery in Washington, DC. A tour group of 15 toured the final resting places of spiritualists, scientists, and political figures with legacies tied to conspiracy theories and popular myths, as compiled in "A Skeptic's Guide to the National Capital Area," a work in progress published online by NCAS. Tour guides Grace and Chip Denman, lead researcher Beth Kingsley, and Scott Snell spent a few minutes at each location describing its significance. After the SkepTour concluded, many of the participants proceeded to Trusty's, a tavern located at 1420 Pennsylvania Ave SE for food, drink, and conversation. "A Skeptic's Guide to the National Capital Area" is an ongoing project for the National Capital Area Skeptics, and will include locations across the VA-MD-DC area. If you'd like to contribute suggestions, please write to SkepTour@ncas.org. The latest edition is available at http://goo.gl/maps/lt1y8. The next NCAS SkepTour is planned for May or June 2016. A new weekly "reality" TV series premiered on August 25 on ABC Family: "Monica the Medium," starring Monica Ten-Kate, a 2012 graduate of Oakton High School in Fairfax County, VA. Now a 21-year-old junior, majoring in communications (not surprising for a "spirit medium?") at Penn State University, Monica's adventures in "navigating friends, family, relationships – and the fact that she's a medium and can talk to dead people," are chronicled. 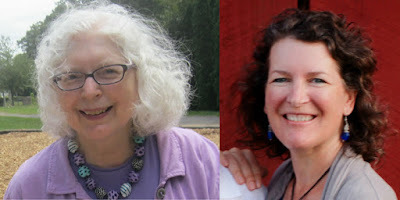 An early, perhaps first, online article about Ten-Kate states that she "returned to her hometown in northern Virginia to speak with another medium about her developing gifts. The medium soon became Ten-Kate’s mentor." This occurred in early 2013, during her freshman year at Penn State. So she's had at least a couple of years to develop her technique. ...And a Local Library Employs the Services of "Ghost Hunters"
Staff at Glen Burnie Library of Anne Arundel County, MD recently "called in the experts to investigate [a special, unearthly visitor stopping in from time to time] - the Maryland Ghost Trackers." Nevertheless, an assurance that no tax dollars were spent on "ghost hunting" would seem to be in order. The ghost hunters (and probably the library staff who brought them on the hunt) will be on hand at the Glen Burnie Library on Tuesday, October 27 from 6:30 to 8:30 PM, so patrons can "learn about the fascinating world of ghost hunters." Some members and contacts of NCAS receive a postal notification of this and every new monthly Shadow of a Doubt. The Shadow Light postcard announces the monthly lecture and highlights of the electronic Shadow of a Doubt, which is available online atncas.org/shadow. NCAS thereby reduces Shadow production and postage costs. To further reduce costs, members and contacts can opt out of postal notification altogether, while continuing to receive Shadow of a Doubt via e-mail. To opt out, send us an e-mail at ncas@ncas.org. View NCAS Shadow of a Doubt online at http://ncas.org/shadow.